The 260 Remington also known as the 6.5 - 08 and is a square wildcat round that entered mainstream production in 1997. The caliber is one of many wildcat cartridges that utilized the 308 Winchester as its parent case. 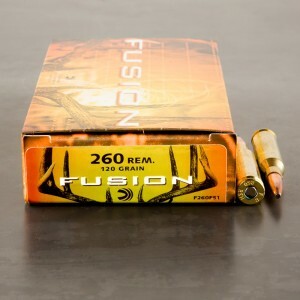 260 Remington ammo features exceptional ballistic coefficients, which make it an excellent long range and competition round. The round is popular around the world, including in European nations. 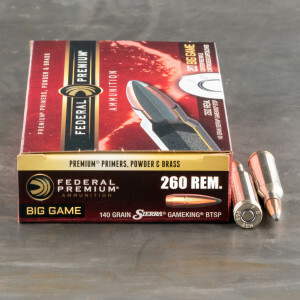 260 Rem is also used as a medium game hunting round but is effective against larger deer species, like elk. Utilizing lighter bullet weights, the round can also take both predators and varmints, without causing excessive damage. When loaded with a 140 grain round, 260 Remington ammunition is capable of reaching speeds of up to 2,750 feet per second. The round also features moderate recoil, and lowered concussion and noise compared to the original 308 Winchester. Those factors make 260 Rem an excellent choce for smaller framed shooters, and even young teenagers. Great Ammo. Been using it for years. Has always been consistent.